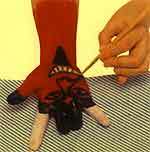 Use your hand the right way, and you can have it transformed into a little devil. Sounds a great idea for a trick or treat expedition, a halloween party, or just to scare the wits out of your friends. And the best part is, it is simple to make, with no elaborate costumes or expenses. So, a lot of fun for free! Alright, prepare yourself to bring out the devil in you! 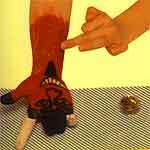 Lay down a kitchen cloth and sponge the palm, back of the hand, wrist and the thumb red. After drying, paint the first and the little finger white, while the other two black. When dry, paint tip of the thumb, and base of the little finger black. Paint the devil's face and beard using the medium brush. Outline the teeth with black, and fill in with white face paint. Use a finger to gently smear gold-glitter gel over the red paint on the wrist. This will make your devil shimmer and glint. 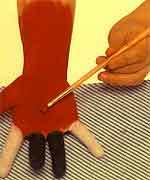 And to finish, cut a length of red nylon netting, and tie around the wrist. Also cut the devil's trident from black paper, and glue it with the net. And Now you are all set to be the devil of this halloween!